Apples are a good choice at the end of any fast given how easy they are to digest. They also contain high quantities of malic acid, which both detoxifies the liver as well as softens and dissolves gallstones. While on one of my daily walks, I found an apple tree growing wild in a field, and picked the juiciest looking fruit I could find! I also knew I wanted to involve citrus in the smoothie because the acids help to detox and reawaken the liver after the fast. This time, instead of an orange, a lemon was the obvious choice, given how readily available they are in any season. Ginger and peppermint aid in digestion. I’m lucky enough to have peppermint in my garden, so I cut a fresh sprig. Watermelon… I have to admit that the watermelon was pure indulgence! 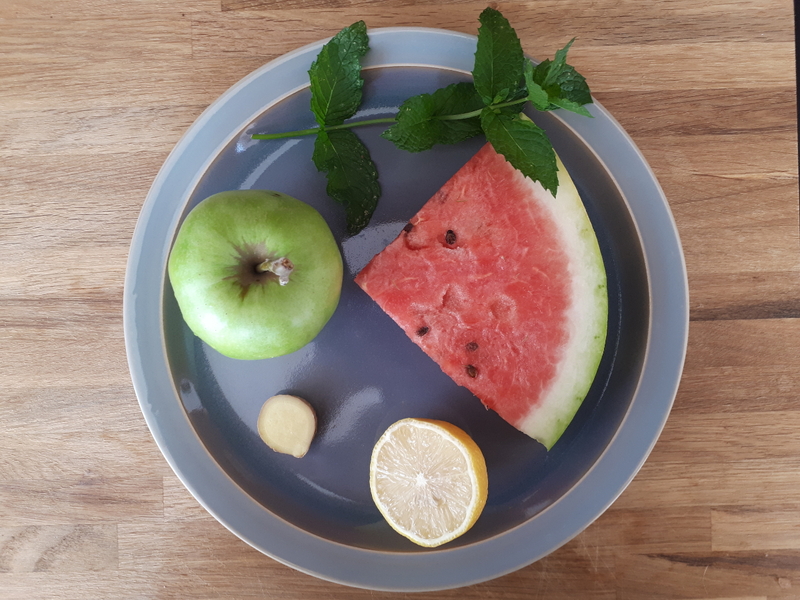 To be honest, on its own, the high sugar content and glycemic index of watermelon makes it a less-than-ideal fruit after a fast of more than one or two days. Ideally, you want to ease slowly back into sugars in order to avoid (1) the jitters of a sugar high, as well as (2) disrupting blood salt levels. (This is especially true after fasts longer than a week.) In combination with the apple, though, I wasn’t overly concerned, especially since the total caloric content of the smoothie came to a mere 120-150 calories. And after all, it was precisely the prospect of tart apple combined with sweet watermelon which tantalised my taste buds! De-pip and chop the apple and watermelon, squeeze the lemon, grate the ginger, pick a few peppermint leaves off the sprig and place in a blender. Add enough fresh spring water to cover the solids (1-1.5 cups / 200-300 ml). Blend thoroughly, until no trace of individual peppermint leaf remains. Pour into a glass, add the remaining sprig of peppermint for both decoration as well as aroma, and enjoy! Awsome have to try this thanks for sharing Tallis !